Heat oven to 375°F. Unroll dough; separate into 8 triangles. Place in ungreased 9-inch square pan or 10-inch pie plate; press over bottom and up sides to form crust. In 10-inch skillet, cook beef over medium heat 8 to 10 minutes, stirring occasionally, until thoroughly cooked; drain. Stir in salsa and taco seasoning mix; simmer 5 minutes. 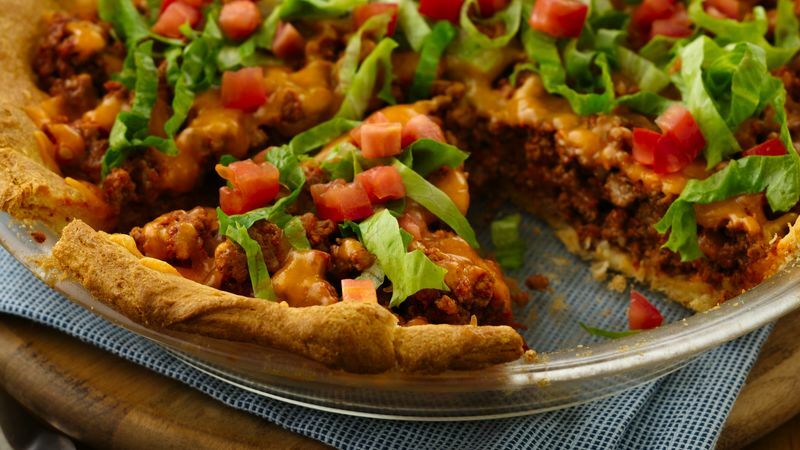 Spoon meat mixture in crust-lined pan; sprinkle with cheese. Bake 14 to 17 minutes or until crust is deep golden brown and cheese is melted. Served topped with lettuce and tomato, if desired. Pile on your favorite toppings! Try shredded lettuce, chopped tomatoes, additional salsa, sour cream and avocado slices. A 4.5-oz can of Old El Paso® chopped green chiles can be added to the meat mixture.